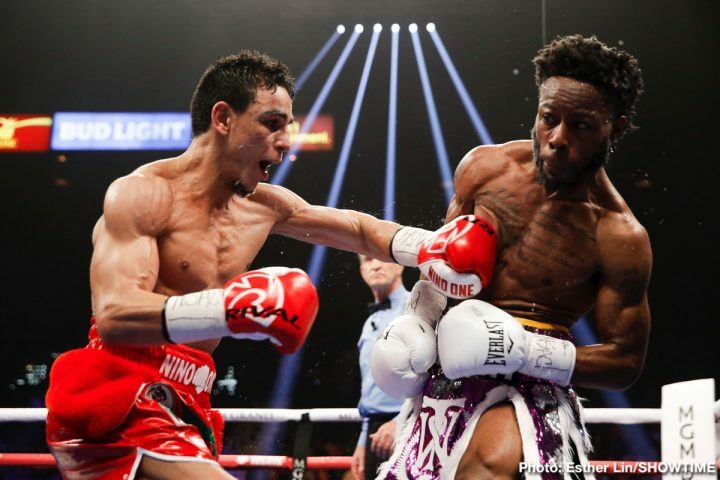 By Jeff Aranow: In a competitive fight, unbeaten Nordine Oubaali (15-0, 11 KOs) defeated Rau’shee Warren (16-3, 4 KOs) by a 12 round unanimous decision to win in the vacant World Boxing Council World Bantamweight title on Saturday night on the undercard of Manny Pacquiao vs. Adrien Broner on SHOWTIME PPV at the MGM Grand in Las Vegas, Nevada. The judges’ scores were 115-113, 116-112 and 117-111. 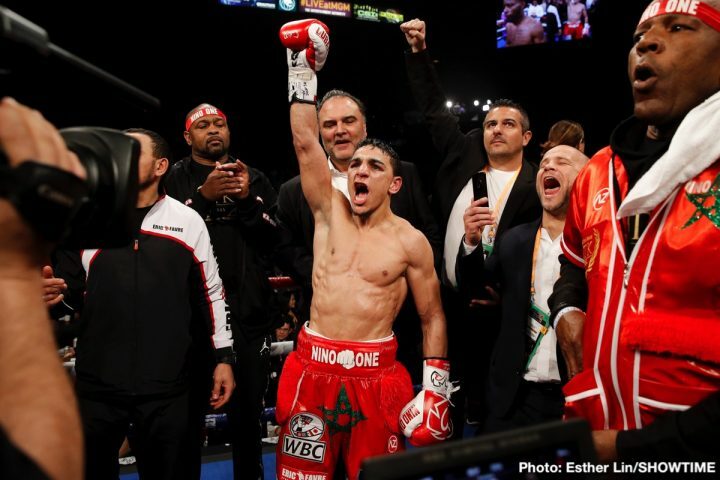 Boxing News 24 had the 32-year-old Oubaali winning by the score 117-111. 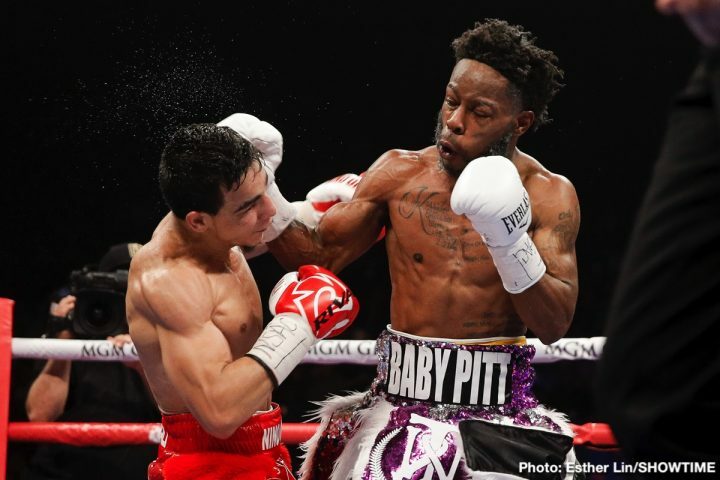 Warren fought well in the first seven rounds, but he gassed out in the later part of the fight, and was outworked and out-punched by the two-time Olympian Oubaali. This was a rematch of their fight in the 2012 Olympics, which saw Oubaali edge Warren by a 19-18 score. Oubaali had Warren hurt a couple of times in the early rounds, but he wasn’t able to put him away no matter how hard he tried. Warren’s punch resistance and heart got him through some tough times early on. 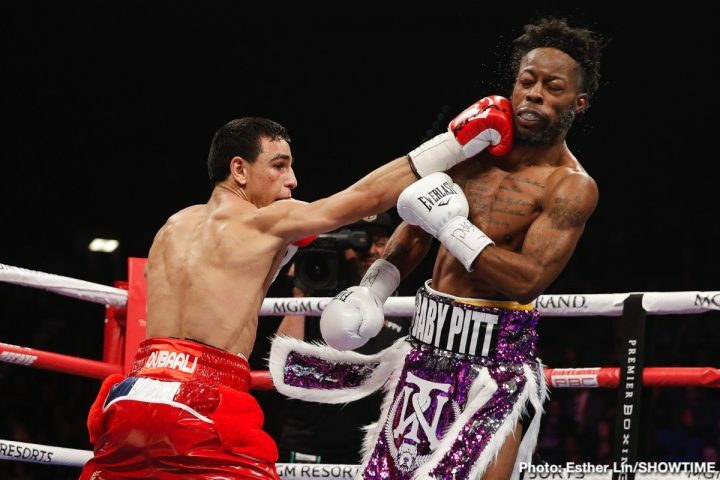 In the second half of the fight, Oubaali closed the distance and worked Warren over on the inside with short, compact punches to the head and body. 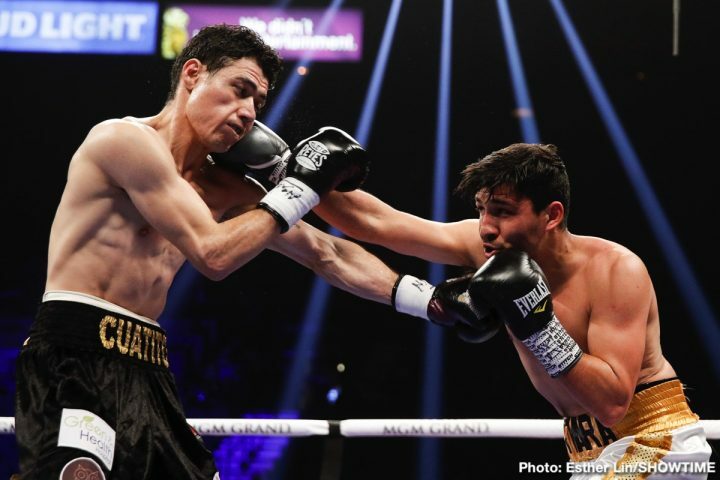 The energy drained away from Warren’s game entirely in the championship rounds, and his punching power wasn’t enough to keep Oubaali off. Warren still did a good job of jabbing and boxing, but he lacked the power to win rounds when he needed to. 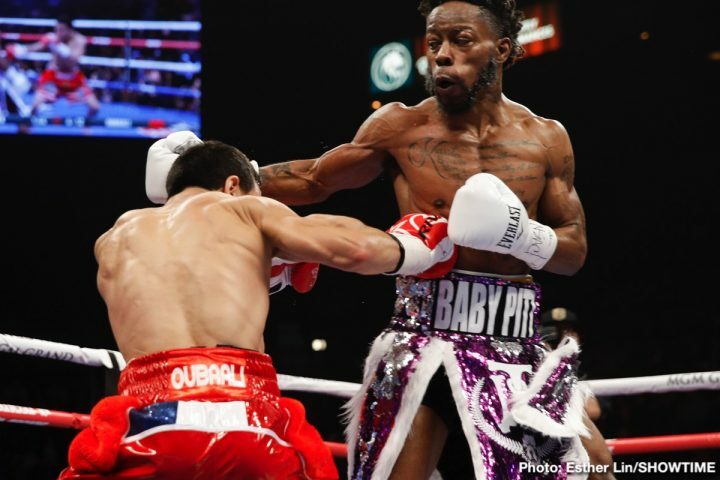 At the same time, Oubaali looked like the better fighter of the two with the way he was pushing forward and attacking Warren. Overall, it was a good action fight. Warren is a couple of years removed from being a world champion after losing his WBA belt to Zhanat Zhakiyanov in 2017. Warren lost that fight by a 12 round decision. 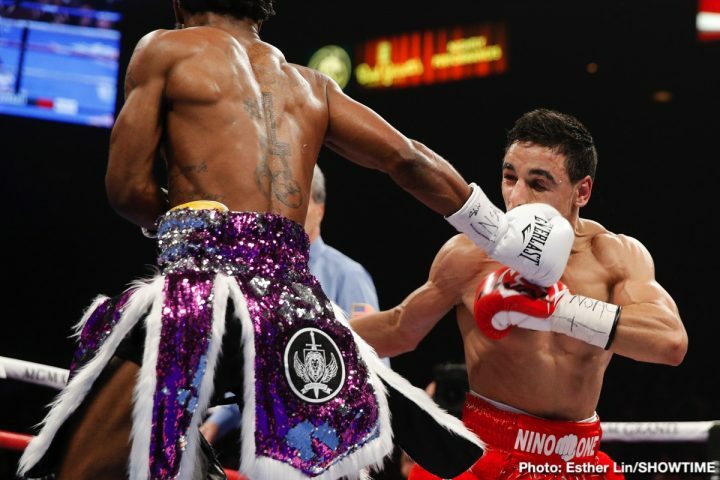 It was the same situation for Warren as his defeat tonight against Oubaali. 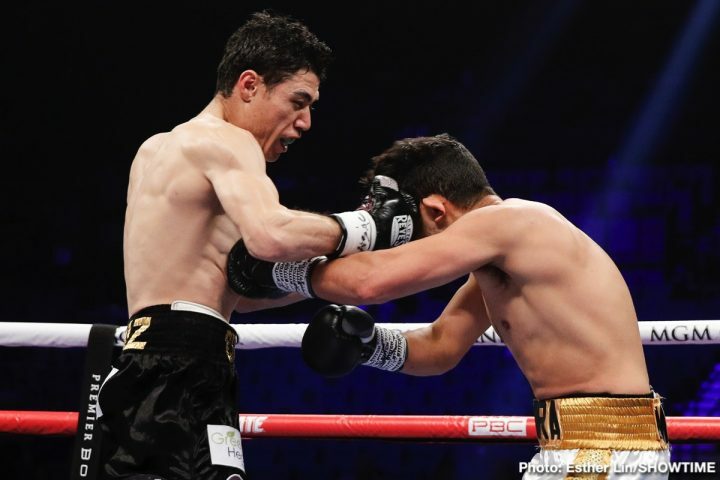 Warren’s lack of punching power made it hard for him to win rounds against the heavy handed Zhakiyanov, and that led to him losing the fight. 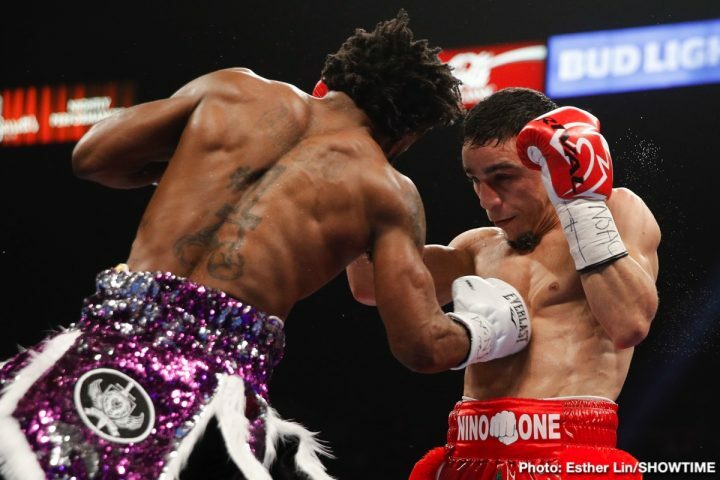 The bantamweight division has suddenly improved a lot since the time Warren held the WBA title. 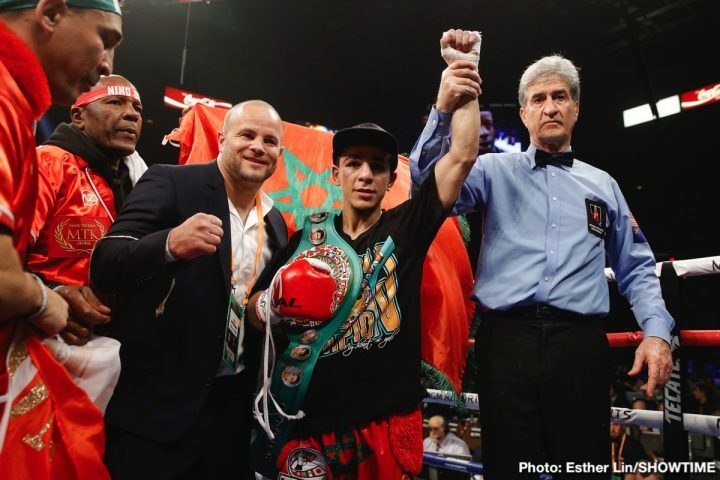 Even Oubaali is going to have a hard time holding onto the WBC title for any length of time. #3 WBC Luis Nery is breathing down Oubaali’s neck now. It’s going to be hard for Oubaali to turn back the threat of Nery. 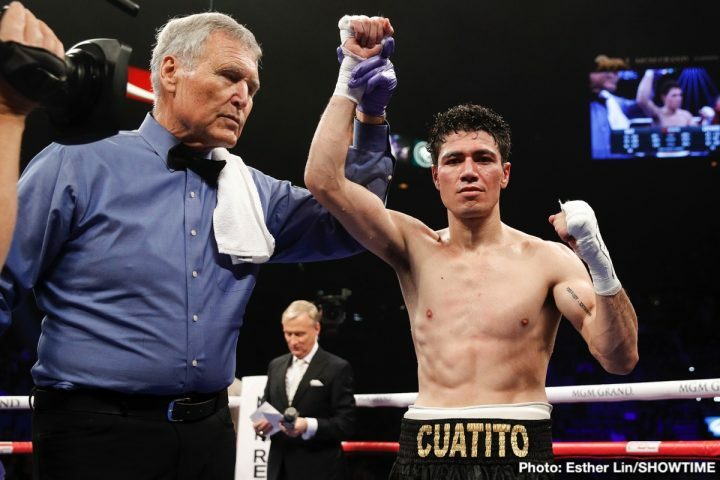 In other fights on the card, former WBC super bantamweight champion Hugo Ruiz (38-4, 31 KOs) defeated Alberto Guevara (27-4, 12 KOs) by a 10 round unanimous decision in featherweight action. The scores were 99-90, 99-90, and 100-89. The over-matched Guevara was a replacement for Jhack Tepora, who came in overweight at the weigh-in, and then subsequently pulled out of the fight. Ruiz knocked Guevara down in round 1. From there it was just a one-sided affair.